Tulips are heralds of spring. They don’t have to be. Tulips growers know that tulips blooms based on the particular time of year they were planted. Many tulip lovers don’t want to wait for the traditional tulips from an outdoor garden. They grow them indoors and have their favorite flower for cuttings to fill all of the vases in their homes and business offices. There are a few basic steps to learn how to grow tulips indoors. Take the time to study tulips and their normal growth patterns for best results. Traditionally, tulips are planted outdoors in late fall or early spring to produce blooms. When planted in late fall, tulip bulbs are hardy enough to withstand cold winter climates. However, for extreme cold, it may be best to plant tulip bulbs in early spring as soon as the soil is workable. Bulbs need to be planted four to six inches deep in rich loam soil to create healthy roots and deep colors of blooms. Generally, tulips are in bloom in Zones 1 and 2 from the last week of March through the end of April. In the other four zones, tulips bloom faster due to warmer temperatures. Also, be aware that zone maps vary. Some maps feature only six zones. Others include eight. This is a reflection of the extremes in climate and temperature ranges. In most cases, the packaging and label will provide the most accurate information on your particular zone. These are important to determine how hardy tulips will be under varying zone temperatures. It’s possible to plant tulips indoors any time of the year. It’s important to inspect the bulbs before planting them indoors in pots. Select larger bulbs for indoor plantings as they don’t need time to mature to bloom as smaller bulbs do. Tulips don’t require very deep pots. In fact, they do best in wide clay dishes. They make wonderful decorations for any room in the house. It’s possible to have an indoor tulip garden by arranging pots decoratively and according to varieties of tulip colors. Tulips like rich soil best. For indoor tulips, choose a good medium at the base of the pot like sphagnum moss. Then fill the pot with rich, dark potting soil to about one-half inch from the top. Place tulip bulbs in potting soil and cover with more soil allowing only the tips of the bulbs to show. Common varieties of tulip bulbs are hardiest. Variegated species of tulips are not as hardy and prefer more natural growing environments. This is the reason for choosing common varieties for indoor growing. Don’t forget to coordinate the colors of the tulip bulbs you select for indoors. It can make all the difference to the color scheme of a room. For example, lighter tulips do well with darker colored rooms. Add darker colored tulips where more drama is needed. Tulips are available in a wide range of colors. Red, white, yellow, deep purple, coral, apricot, fuchsia, green, pale to deep pink, orange and variegated colors that mix yellows with reds, oranges and are often striated with tinges of green. There is also a difference in tulip sizes. Tulips grow from about six inches in height to more than twelve inches, depending on the species. With the cross pollination processes used today, tulip sizes and colors can vary. For indoor growing, such variety is a great opportunity to create the most attractive indoor tulip garden that can surprise family and guests. Businesses also like to add tulip gardens to their offices. Tulips require minimal maintenance compared to other indoor plants. The profusion of colors makes any dull office brighter. One of the basic reasons gardeners love to plant tulips is that they can resist damage even when a late spring snow storm occurs. These flowering plants are quite accustomed to cold weather. Blooms of tulips rarely last more than two weeks indoors or out. This is one reason indoor gardeners should consider varying their planting times so they can enjoy the blooms the year round. 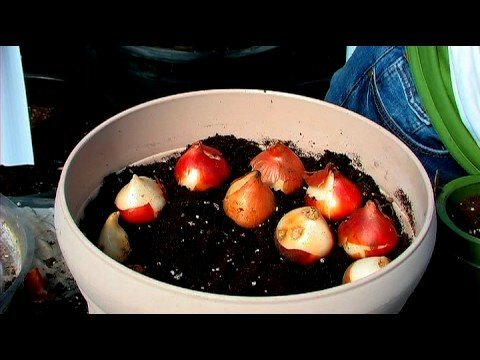 Plant tulip bulbs indoors about two months apart in separate pots. Tulips do best if they are not crowded in pots. The way to know how many bulbs to plant in a pot is to measure the overall diameter. For example, a pot that’s six inches in diameter will allow for six tulip bulbs to bloom and grow comfortably. To create more interest for indoor tulip gardens, choose pots of varying sizes. Then, plant red tulip bulbs in two or three pots and white tulips bulbs in one or two pots. When they bloom the red and white colors will catch attention quickest. Another color scheme is more subdued. Plant pink tulip bulbs in two pots and surround these with a profusion of dark red tulips in four pots. Indoor potted tulip plants are like having a florist shop right in your own home or office with you as the designing florist. Finding the best quality tulip bulbs today is easy. A local garden center will have several top quality varieties that are ideal for indoor planting. Shopping for tulip bulbs is fun. The garden center will also supply pots, potting soil and watering cans for indoor gardeners. Tulip bulbs are also sold online here and here. Check out those sold directly from Holland and those sold in the USA. These will mostly be shipped at the appointed growing time according to the tulip suppliers’ schedule. However, if you desire to purchase tulip bulbs for indoor gardens, be sure to check the online site for the best choices of tulip varieties for this purpose. Growing tulips indoors requires less protection than those grown outdoors. Indoors, ordinary dust affects the moisture retention of tulip bulbs. Keep bulbs in a relatively dust free area. Before planting tulip bulbs, check for signs of black rot. Discard any bulbs that appear to have this type of damage. Growing tulips indoors has allowed gardeners a much wider selection of the texture of tulips. The most common tulips are glossy and have sturdy stems. The petals tend to be well shaped. Other species of tulips have fringed edges to give them added appeal. Still other tulips have longer petals that separate into lily-like shapes. Don’t forget tulips can also be paired with grape hyacinth, bells of the snow, aromatic hyacinth, daffodil and jonquils in indoor gardens. These flowering bulbs, unlike perennial indoor tulips, have short-lived blooms and will only produce once annually. They add a refreshing change to an indoor tulip garden. The method for propagating tulips is relatively simple. Tulip roots tend to create offshoots. When tulip bulbs are dug up after the first blooms die off, the tulip gardener will discover smaller bulbs clinging to the roots. These can be removed and replanted to create more tulip plants. Also, certain tulips species cross pollinate when they are growing very close in proximity to each other. This cross pollination often creates a different color or species of the original tulip plants. Indoor tulip gardeners can encourage propagation by planting bulbs closer in pots. All the joy of an indoor tulip garden is seeing all of the work and effort produce glorious colored plants. Since these will grown indoors the year round, consider entering your most prized tulips in the local state or municipal fair.